If you were to ask me what I’m most self-conscious about, my answer might surprise you. While I’m fairly accepting of the body I was born with, ever since I was 13 years old I’ve been acutely aware of my knees. That’s the age I was when my left knee cap took off on its first journey, dislocating during a track meet and causing the rest of my body to crumble into a shocked heap on the ground. If that sounds dramatic…well, it was. Ever since, my knees have become the unwelcome barometer of my health as they squeak up the stairs (not enough glucosamine), crunch under weights (did you take your Omega 3-6-9 today? ), and puff up after the gym (pushed myself too hard…again). I wish I could say from that point on I made caring for myself a priority, but come on, I was 13 years old. It took a few more years for me to take control and begin to investigate ways to make my knees and joints and overall self a little less squeaky. Along with the right kind of exercise and a proper diet, focusing on a long list of anti-inflammatory foods and supplements has, by and large, made the largest difference. And sitting high at the top of that list is turmeric. 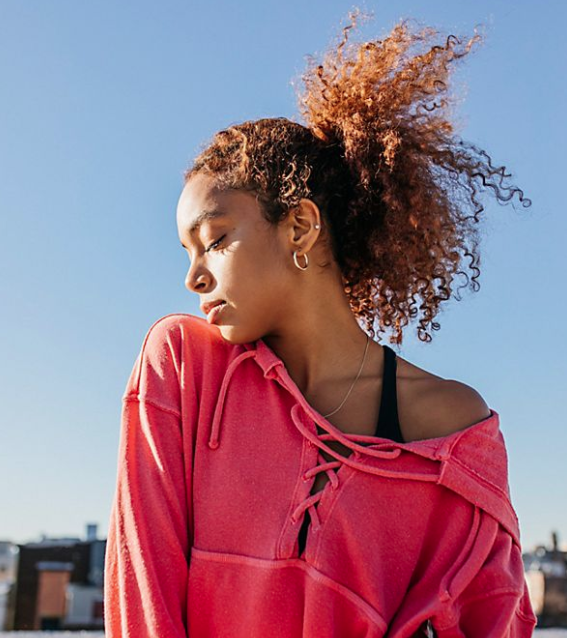 We’ve sung the praises of turmeric before, and if you’re still unfamiliar with this miracle rhyzome, winter is the perfect time of year to get acquainted. Recognized as a powerful anti-inflammatory thanks largely to its pigment, known as curcumin, turmeric has been shown in some studies to be as effective as some over the counter anti-inflammatory drugs. Beneficial for those with osteo- and rheumatoid arthritis, curcumin travels through the system neutralizing free radicals and flushing out chemicals that otherwise would linger in joints and tissue. Along with benefiting joints and tissue, turmeric aids in liver function, cardiovascular health and boosts immunity (along with a mile-long list of other pluses, including but not limited to preventing Alzheimer’s and inhibiting cancer cell growth). 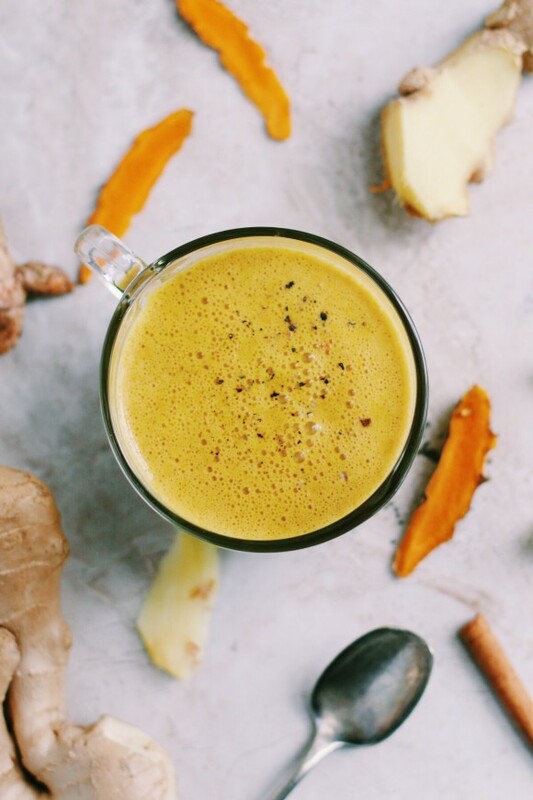 If you’re not convinced to add this pretty yellow spice to your everyday routine, I’m not sure what will… Maybe a delicious latte? 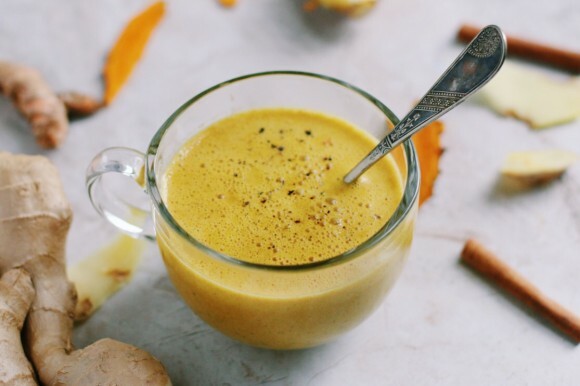 While it’s a fantastic addition to curries, soups, stews, cold salads and smoothies, my favorite way to incorporate turmeric into my diet as of late is with the soothing nighttime latte below. 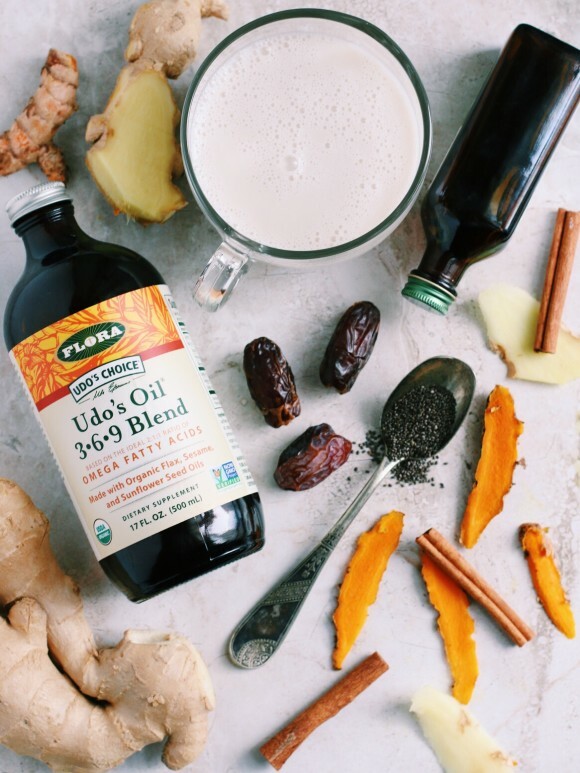 Rich and creamy and naturally sweetened thanks to a Medjool date, this warming, spicy drink is the perfect way to wind down after a busy winter day. 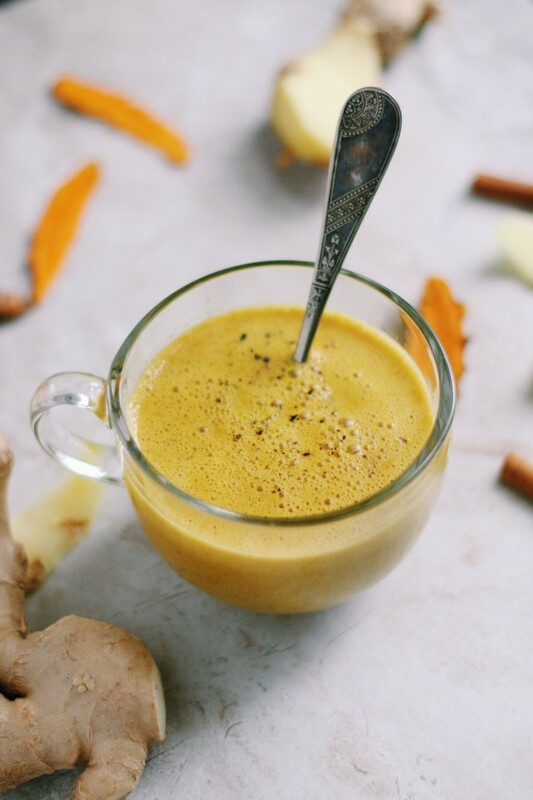 Combined with a pinch of black pepper to activate the curcumin, joint-healing EFA oil, antioxidant-rich chia seeds, and powerful ginger and cinnamon, this turmeric latte eases the aches in my knees while benefiting my entire system. Try it tonight and I can almost guarantee you’ll be craving it tomorrow and all the days after. Note: you can also use fresh turmeric rhizome and fresh ginger by substituting a peeled 1-inch section of turmeric and a few shavings of fresh ginger. Japanese, Korean and Chinese markets often sell inexpensive and extremely fresh turmeric and ginger root. Place nut milk, dates, vanilla, chia seeds, turmeric, cinnamon and ginger (+ cacao, if using) into a blender and blend until smooth. Transfer the blended mixture to a small pot and heat on low until hot but not boiling. While the mixture is heating up, pour the EFA oil (or coconut oil or ghee) into the bottom of your mug. 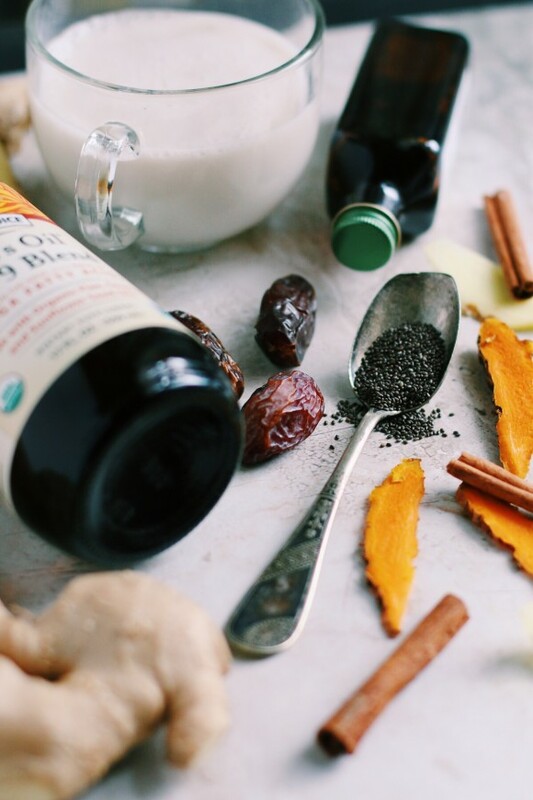 You can also blend the oil or ghee with the nut milk mixture, but if I’m using a pricy oil, I like to get the most bang for my buck by adding it directly to the mug — nothing lost in the nooks and crannies of my blender. That sounds like an interesting mixture, I will definitely try that! Sounds wonderful! Why would coconut milk not be just as healthy–to say nothing about tasty–as nut milk? That is what I will try, since it’s what I have on hand. 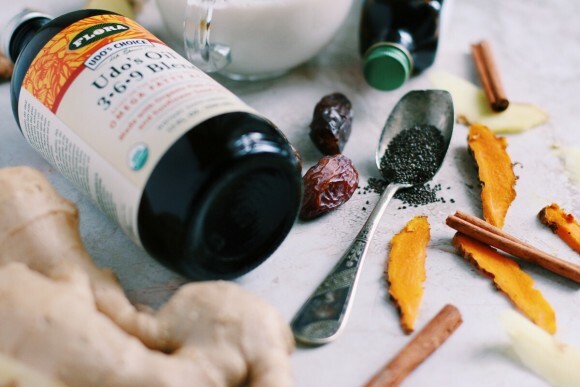 Thanks for sharing this recipe – I’ve had bad knees since my mid-teens and now my hips have their off days too, so I’m looking forward to giving this a go and seeing the effects! Wonderful yummy taste! I’ll enjoy this anytime of the day, thx for sharing. Hoping this helps my achy joints! I tried it and loved it! Thanks for sharing. I will definetly do it again. This is great, except that this Udo’s oil isn’t meant to be heated! Since it contains flaxseed oil and other unsaturated fats, it will be easily oxidized. Why not just use MCT or ghee instead? I love Udo’s, but its best in a cool smoothie or right off the spoon!